Let's start off by talking about how cute my brother & I were, okay? 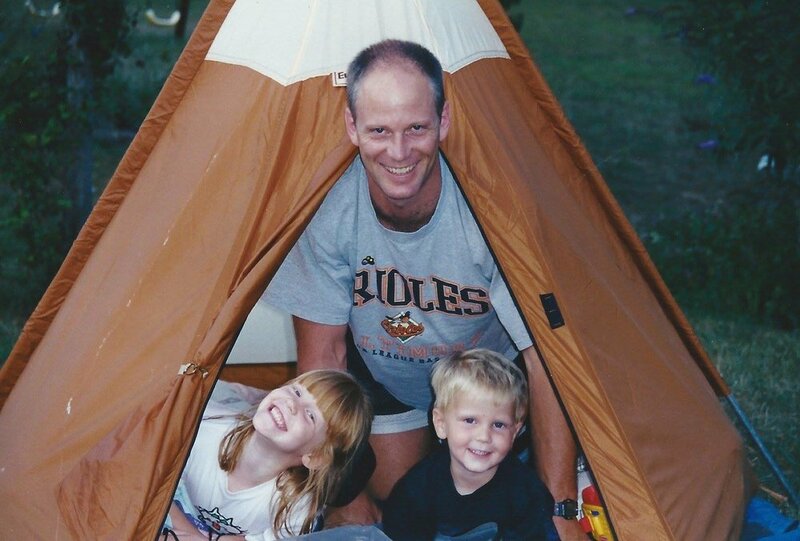 This tent was my first real one - we would camp with my dad in our backyard and it always felt like the biggest adventure. We eventually upgraded from this little 2 person, teepee-like tent to a 5 or 6 person and I had my third grade birthday party as a campout. From third grade till two years ago, I took a break (save for one night camping with my little sister after having seen A Haunting In Connecticut... that might be the reason it took me so long to camp again). After moving to Colorado, though, the call of the outdoors was almost insatiable. I knew Logan and I needed a tent, so I asked my parents for one for Christmas. I knew I wanted a two person backpacking tent, and mom and dad did some research and ended up with a perfect one. The Nemo Galaxi 2P tent is fantastic for mine & Logan's weekend getaways. Its light and I can set it up by myself (as long as the wind isn't too crazy) and it has lots of little nooks and crannies for all the stuff we end up bringing along. This tent has been all across the country with us, too, and holds up well under lots of conditions. We camped on the coast of the Pacific Ocean and it let enough of the sea breeze in that I didn't suffocate from heat. It kept us toasty warm (and protected us from coyotes) in Yosemite National Park. It was a perfect basecamp for a weekend in RMNP. And it saved us from a sandstorm in Monument Valley. It has huge vestibules (which are kind of pictured above) that easily fits a pack while keeping it dry/safe from the elements. The doors roll back and use magnets to keep closed, making it super easy to attach, while also keeping it from getting damaged is you're as unaware of your general surroundings as I am. There's a light pocket at the top that is supposed to act like a diffuser, gently spreading light from a headlamp throughout the tent. We never use it that way, though, and instead stick our keys or headphones in it so we always know where they are. The material (coated ripstop nylon) is incredibly durable and can withstand a ton - from sand storms to pine trees. It is a decent size and weight, though at 5lbs, 8oz, it's not exactly ultralight. It comes with the option, though, to pitch with just the fly and footprint (which is included), which shaves that weight down to 3lbs, 10oz. The inside 90"x54" (or, 7.5 ft x 4.5 ft). At the center, it is 40" high (3.3 ft). It's just enough space to change clothes, which is all I ask for! Unfortunately, the sides aren't quite high enough to keep all the sand out. It really is a solid little guy, though, and I love the color. As I start planning some pretty incredible things for 2019, I am glad I have the Nemo Galaxy in my arsenal.